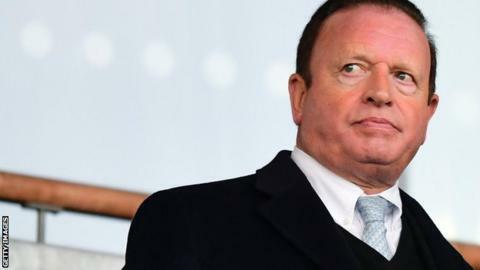 Bolton players will meet with chairman Ken Anderson on Friday to talk about unpaid wages at the Championship club. Manager Phil Parkinson has already spoken to his squad after November's wages were not paid as scheduled on Friday morning. In pre-season, players called a strike and matches were cancelled over a similar issue. "Ken will chat to three or four of them because they want to ask him when they will get paid," Parkinson said. "We had a meeting with the players today, some of them have been here a long time and are kind of used to situations cropping up." Bolton, second from bottom in the Championship with just one win from their previous 15 games, have been plagued by financial issues in recent years. The Trotters avoided administration in September after former owner Eddie Davies gave the club a £5m loan four days before he died. A company which owned more than a third of Wanderers' shares was liquidated in August 2017 and most recently the club had to deal with a winding-up petition over unpaid taxes in October. In addition to a player strike and pre-season matches being called off over non-payments, the Professional Footballers' Association had to intervene after a number of former players complained about non-payment of bonuses. "We understand the problems the club face and we've got to deal with it," Parkinson told BBC Radio Manchester. "The lads have been good, a few of the senior ones came to see us this morning and they have asked about staff at the training ground as well." The Trotters boss said he spoke to players about focusing on their "professionalism" as they prepare to face neighbours Wigan Athletic on Saturday. "You have to be honest, we could do without it," said Parkinson. "No-one would want this on the eve of a big game. "I know Ken is working hard to resolve the situation. "It's not ideal but it is about dealing with it and blocking it out heading into tomorrow's game."